Well, someone had to do it – ie. 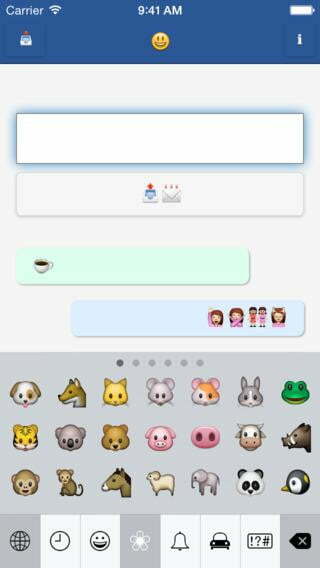 create a messaging app where you can only communicate using emojis. Many people thought it was a joke. It wasn’t. The app is now available for iOS devices via the App Store. If you’re at all tempted to put the app through its paces, you’ll first have to create a username consisting entirely of emojis (well, what did you expect?). Speaking over the weekend at the Electromagnetic Field hacker event in Bletchley, UK, the pair gave an entertaining talk about their experiences building Emojli. They admitted that Emojli essentially grew out of a “silly idea,” adding that what surprised them most was that no one else had released such an app before. When they put the promotional video up in July, they thought everyone would just have a bit of a giggle and quickly forget about it. However, 70,000 people – yes, 70,000 – signed up to claim a username, leaving Matt and Tom, who both have full-time jobs, with little choice but to actually build the app. Drawing on their programming skills and experience (oh dear, Matt didn’t have any), the two friends spent a month cobbling something together that they could submit to Apple’s App Store. Related: Can indie app developers still make it? For all the support time you have to put in (they’re also having to wade through emails from users of another app called Emojli, which mysteriously showed up soon after their video landed on YouTube), and the lack of financial return, Tom insisted that overall it’s not worth the effort. Delivered in good humor, the talk may actually inspire those without any programming experience to have a crack at building their very first app. “I’m very proud of the fact that we know bugger all about making apps and we seem to have made one and launched it and got 70,000 registrations,” Tom said. The two friends appeared to suggest that at some point they’d be happy to sell Emojli to a new owner, enabling them to return to their regular lives, which will no doubt steer well clear of app development for the foreseeable future.